Home › Current Issues › A Listener Wonders: Did We Help Ashbrook Stay in Power for Too Long? A Listener Wonders: Did We Help Ashbrook Stay in Power for Too Long? In a small Italian restaurant outside Boston on December 8, 2017, I heard a buzz from my phone. Shocked, staring at the breaking news alert, my mother and I sat in silence unable to comprehend that our favorite radio host was being suspended for allegations of sexual misconduct and creating an abusive work environment. She had just donated to WBUR that morning, in part because of her appreciation of Tom Ashbrook’s daily politics and culture show, On Point. That night, I refused to believe the allegations. I couldn’t accept that his authentic and balanced on-air persona masked a tyrant in the workplace. Now, after two months of investigation, Ashbrook has been fired from WBUR, and I realize that no matter what he did, I should have never assumed he was as perfect as his on-air persona. 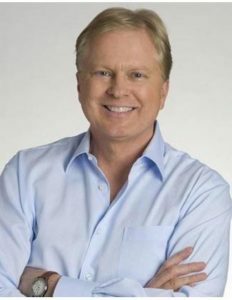 Until he was fired, Tom Ashbrook had been on a leave of absence from the nationally syndicated program he hosted at WBUR for sixteen years. In early December, a group of eleven men and women had written a statement to the station accusing Ashbrook of creating an unhealthy work environment by berating staff, (particularly female members), and offering inappropriate hugs and massages after difficult discussions. Outside investigations took place by Boston University, the station owner, to look into the case and the claims made in the report. Over sixty people were interviewed, and Ashbrook was ultimately charged with creating an unhealthy work environment, but the sexual allegations were dismissed. Ashbrook himself responded early on, via Twitter and other news sources; he denied the charges but agreed he would sometimes be hard on staff members to achieve a “top-notch show.” Prior to this, nothing negative had ever come out about him. Ashbrook was widely respected by the audience; he was an excellent facilitator on-air because he challenges each guest’s ideas, without being argumentative. He always maintained a friendly demeanor and always seemed composed, no matter how intense the topic. This is certainly how I experienced listening to him. Smart, balanced, kind, deeply concerned, and caring about all the wide range of issues he explored in depth. But off-air, apparently, his personality seems to have projected a very different story. Many people, including Ashbrook himself, think it is an exaggeration to say that he was verbally abusive. However, in reality, listeners like me must grapple with the fact that someone we trusted with the news has been trampling on the emotions of co-workers for years. Although he has been “guardian of the truth” on air, the station guarded the truth about his work style for far too long. There were a lot of components that went wrong in the story of Tom Ashbrook and On Point. He did not practice emotional self-control. The station didn’t challenge Ashbrook enough throughout the years, and left the problems alone, until they got worse. But also, we fans are to blame for trusting that we know these voices on the air, when in fact we really don’t. We expect them to live up to the potential we have created in our heads about them. The lesson for the fans, moving forward, is to realize that because we saw Tom Ashbrook as perfect, we should not be surprised to find that he was human after all.